Bellagio has earned a prestigious AAA Five Diamond Award for 2016, adding to the collection of awards this property has received. 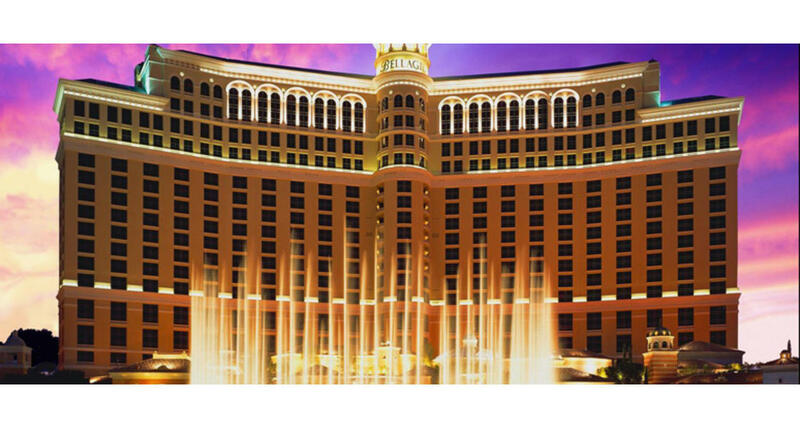 Bellagio combines Old World elegance with modern luxuries in a 3,900 room resort in the heart of the Las Vegas Strip. The Tuscan-themed resort transports guests to the Vegas version of the famous town on Italy's Lake Como. Dancing water choreographed to popular music and show-tunes soars 240 feet above an eight-acre lake, surrounded by deluxe guest rooms and suites, abundant dining, entertainment, shopping and gaming options. While you may not want to leave your posh accommodations, with contemporary custom furniture, fine art, sunken bathtubs and such conveniences as high-speed Internet access, there's much to see and do, eat and buy here. The Conservatory and Botanical Gardens present fresh displays of foliage with the changing seasons, cultivated from a 90,000-square-foot greenhouse located behind the hotel. The Bellagio Gallery of Fine Art exhibits paintings, sculpture and works on paper by the world's most influential artists. The international cast of Cirque du Soleil's "O" - synchronized swimmers, divers, acrobats and aerialists - performs in a theatre reminiscent of the Paris Opera House. Hyde Nightclub offers an evening of exclusive dancing and music, and one of the city's few indoor/outdoor venues with a view of the famous Fountains! Guests of the Bellagio dine at some of the world's best restaurants: The Maccioni family's Le Cirque (an AAA Five Diamond award-winner), Michael Mina by Michael Mina, Jean-Georges Vongerichten's Prime steak house, and James Beard award-recipient Julian Serrano's Picasso, featuring a collection of the artist's masterworks. Along Via Bellagio, you'll find such upscale boutiques as Giorgio Armani, Chanel, Prada and Tiffany & Co. In the spacious, European-inspired casino, try your luck at blackjack, European roulette or pai gow, or in the popular poker room or the race and sports book. Lounge by the pool in a Mediterranean Villa-style setting with relaxing pools, soothing spas and private cabanas surrounded by citrus and parterre gardens. If work's a must, there's more than 200,000 square feet of fully-equipped convention space and a professional staff on hand to oversee every detail. Other hotel amenities include the 65,000 square foot Spa and Salon Bellagio, the lovely wedding chapel and Terrace of Dreams, and access to Shadow Creek, one of the country's most exclusive golf courses.